To mitigate server-level issues that cause costly downtime, NAXYM’s technicians are versed in industry best practices to ensure your IT infrastructure functions like you need it to. With our certifiable around-the-clock support and our proactive maintenance, your servers will be stable and available when you need them. Best yet, if there is a significant problem with your server, we will know within minutes and can immediately take action. With your server’s uptime our priority, you reduce any would-be operational hiccups that hinder productivity. With many businesses now extending their computing infrastructure to the cloud, virtual servers are being utilized more than ever. 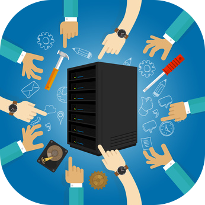 Many organization that chooses to move their computing infrastructure offsite now have servers that aren’t managed through their dedicated service provider. Since these virtual servers are depended on just as much, or more, than your typical on-premise machines, NAXYM offers 24x7x265 monitoring and maintenance of this infrastructure. Whether you host your own servers, colocate them, or rely on cloud-based solutions, our managed server care is right for you. When you are looking to expand your business, or you see deficits in your organization’s network, NAXYM extends our support to evaluate your current IT infrastructure, assess your organization’s needs, and design enhancements accordingly. NAXYM partners with some of the most recognizable hardware and software vendors, and can provide specific and affordable solutions that will allow you to align your IT infrastructure for your current and future needs. For more information about our managed server care service, or any other of our powerful managed service offerings, call us today at (310) 579-0003.